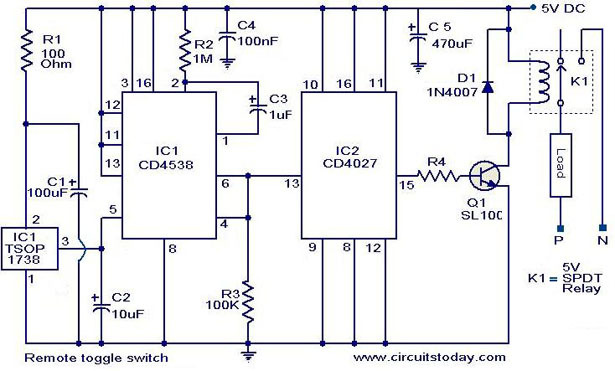 In application level this circuit is similar to that of the circuit given previously. The only difference is in the approach. This circuit is designed by using another method. Using this circuit you can toggle any electrical appliance between ON and OFF states by using your TV remote. The only requirement is that your TV remote should be operating in the 38 KHz. Â The IC1 (TSOP 1738) is used to receive the infrared signals from the remote. When no IR signal from remote is falling on IC1, its output will be high. When the IR signal from the remote falls on the IC1, its output goes low. This triggers the IC2 which is wired as a monostable multivibrator.The output of the IC2 (pin6) goes high for a time of 1S (set by the values of R2 and C3.This triggers the flip flop (IC2) and its Q output (pin 15) goes high. This switches on the transistor, which activates the relay and the appliance connected via relay is switched ON. For the next press of remote the IC1 will be again triggered which in turn makes the IC2 to toggle its output to low state. The load will be switched OFF. This cycle continues for each press of the remote. The pin 6 and pin 4 of IC1 are shorted to avoid false triggering.The diode D1 can be used as a freewheelingÂ diode. The circuit can be powered fromÂ a 5V DC regulated power supply. The capacitors must be rated 15 V.
The IC1&IC2 must be mounted on holders. The current capacityÂ of relay determines the load circuit can switch.Use a high amperage(`10A or above) relay for driving large loads like motor,heater etc. Can TSOP31238 be a replacement for TSOP1738? Hi, could you email to me this project. I want to search some of the components required to do this project. Hi Edgardo R4 should be 470 ohms. Hi Kiran in place of relay use LEDs suitable resistance so that they can handle 4.6volts. i don’t want one with high voltage.i just want to on some led. What is the ohmic value of R4? May I know what is the maximum functioning distance for this circuit? Can I use this for about 25 meters distance? can u pls mention the value of resistor 4 and also pls explain if the capacitor is rated 25v then the circuit will work or not?? can remote controlled switch circuit will work on 6-volt,100ohm resistance relay and 6-volt supply.